Mark, Whenever you use a cable for heavy pulling, you should take care not to cross over itself. Instead of linear contact (like a tourniquet), a crossed cable has point contact (more like scissors, which could either cut or weaken the cable). If you use the barber pole approach spiraling up and around the tree, I don't forsee any issues. Thanks so much for saying that! We're slowly but surely learning about winching, and that's a tip we hadn't seen anywhere else yet. It makes perfect sense, though. I had a nice 20ft 3/8 inch chain I lost on my property also. I bought a metal detector and went over every place I thought the chain might be, but unfortunately I never did find that chain. I think there must be a chain conspiracy. Point contact isn't the only issue. David's comment is a good point. But there is another related issue. If you wrap a steel wire around an object with a radius not much larger than the diameter of the wire, you will strain the outsides of the wire very much. Let the diameter of the wire be "d", and the radius around which it is wrapped "R", then the maximal elongation or compression in the bend equals d/(2R+d)×100%. So if you wrap 1/4" wire around a hook with a radius of 1/4" (1/2" diameter), you'll get an elongation of 33%. This is more than the yield elongation of a lot of kinds of steel. (Note that the angle between the in- and outgoing ends of the cable doesn't matter). Now it is true that your cable isn't a single strand of steel but rather a rope twisted from several strands of thin wire. That is because that allows the strands to move with respect to each other. And it makes the strands act like a coiled spring. This allows a rope a smaller bend radius than a wire. But the principle remains. Making a sharp bend in a rope or wire can cause irreversible damage. The same goes for the point-to-point contact of crossing wires. The first sings of both will be a kink in the cable. So, by wrapping the wire over itself, it's in essence being wrapped around a tiny object when tension gets put on the wire? Is that right? Yes, but that is only part of it. What David points out is valid as well. By overwrapping you also get what is called point contact between the wires. Imagine two cylinders with their lengths perpendicular to each other. Now press them together. With perfect cylinders they would only contact each other in a mathematical point. The engineering term stress is defined as units of force per unit of area. If you only have a miniscule contact area, even a small force would result in a large stress. In a mathematical point with zero surface area, you'd get infinite stress. In practice the contact surfaces will deform, reducing the stress. Consider a knife. It also concentrates the force that you press it down with on the tiny surface of it's edge. That is in essence what makes it cut. Of course twined ropes will not have a single contact spot but a couple of them because of their surface geometry. But the principle remains the same. Two overwrapped wires under tension are essentially cutting into each other. Good analogy with the knife --- helped me wrap my mind around it. What you need to get is a tree strap. It also goes by a tree saver. It's a length of wide nylon strapping with eyelets on each end. 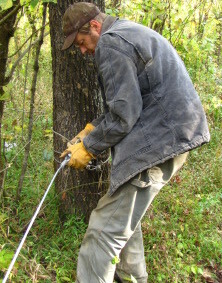 I wraps around the tree and is secured to your winch line's hook through the eyelets. 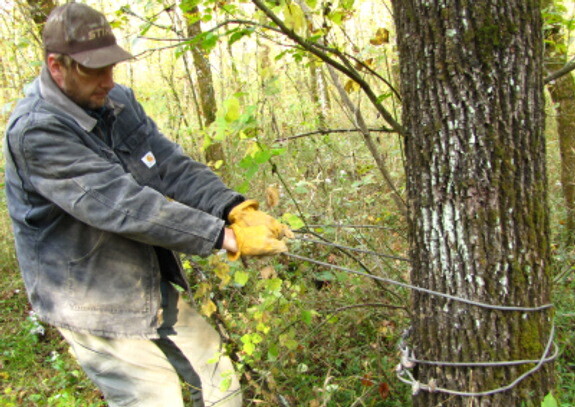 It distributes the pulling load over a wider surface which helps protect the tree as well as your winch line. Also to lighten the weight of your winch you can look into nylon winch line. It's a special rope cable that is super light but still have the pulling capacity of a steel cable of larger size and weight. The tree strap does sound perfect. We have a tow strap that we sometimes use a bit like that, but the ends have hooks rather than eyelets, so it's not as easy to secure to the winch's hook.